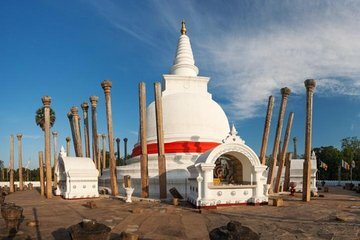 Unless you hire a car, visiting Sri Lanka’s UNESCO-listed ruined capital of Anuradhapura from Colombo in a day is impossible. This private tour delivers: with return air-conditioned transport and a driver-guide to show you around. Roam the temples, ponds, and shrines, including the Jetavanarama stupa; and hear tales of this ancient and sacred city you’d otherwise miss. Lunch and hotel pickup and drop-off are included for ease and comfort.